Parsih Presnače was separated from Visitation of the Blessed Virgin Mary Parish in 1971. Beside some town streets, those settlements were given to the parish: Bosanska Vrbanja, Čelinac, Debeljaci, Presnače and Rebrovac. The very beautiful church of St. Theresa of Jesus Child was made there in 1982, and three years later was proclaimed as a Diocesan shrine. Unfortunately, on May 12, 1995 the church was mined and totally destroyed, the parish house burned, and the parish priest Fr. Filip Lukenda and sr. Cecilija Grgić, after badly torturing, ended their lives like martyrs in the burning parish house, which they didn’t want to leave in such straits. Since that time, the parish house has been renewed, and the church has been just built again and the roof was set. 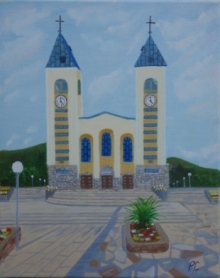 I love all the stories on how you heard of Medjugorje and would like to share with you mine. I was a very cold Catholic. But one day, Mm best friend was killed at a car accident and so was her husband and daughter. She was survived by her son who live in Dominican Republic. Today I had a very interesting lunchtime. I often take my rosary and walk and pray. I do not hide my rosary but let it swing at my side as I walk. Other people are walking too and I am amazed at how much people notice that I am praying. I do not try to make it obvious I just do not hide it. "He Was Lost and Has Been Found"
How does one put into words the immeasurable love, mercy, orgiveness of our Heavenly Father toward His prodigal children? We can never probe the depths in this life. My purpose in writing this article is to show how His love, mercy, and forgiveness led me back to the Church and to the priesthood.